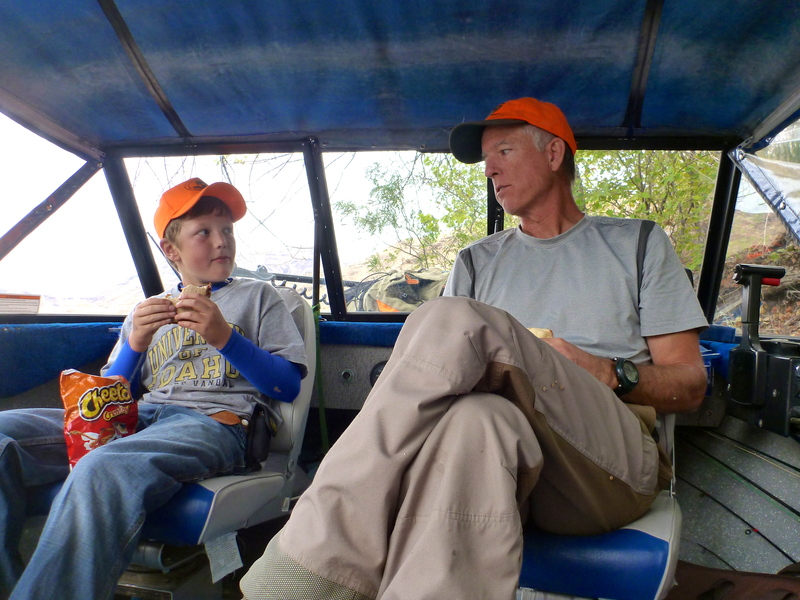 During our lunch break in the boat, I was unable to convince The Kid to trade me his peanut butter (Skippy Creamy), jam (strawberry), Cheetohs (made with real cheese), sandwich (on white bread) for my piece of cold pizza. I tried my best to save face after being shot down, but it didn’t feel good. Never try to separate an 11-year-old from his sandwich. On our way back to the dock, flying along at a good clip in the Sea Runner across some pretty big chop, we encountered a stranded boat, and towed it and its grateful occupants back to the dock. Somewhere along the way, however, our propeller got shredded. Ah, the costs of being a good Samaritan. As far as the non-chukarness goes, my only theory – which is worth its weight in a couple ruffed grouse tail feathers – is that the stiff wind had them hunkered down somewhere we weren’t lucky enough to stumble across. 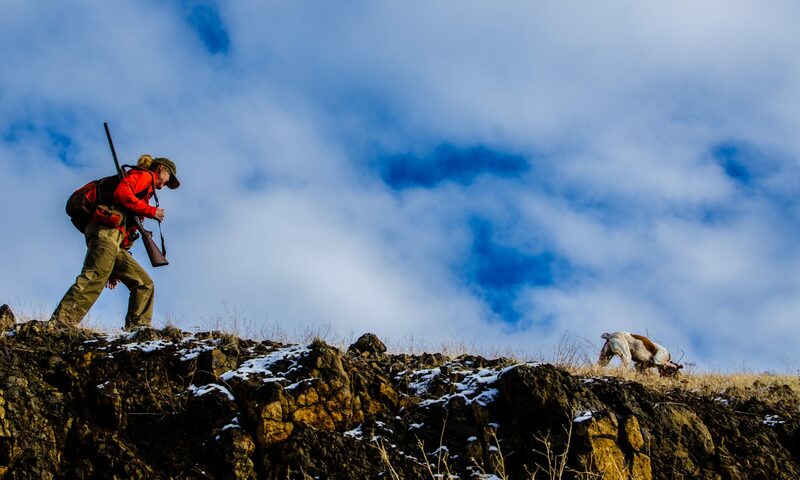 We focused on the leeward slopes and draws, in places we’d heard and seen chukar all summer long. Maybe the change in weather sent them packing to higher ground, but there’s no greenup anywhere yet. Sunday worked out better, without the boat. Angus and I headed up an old, familiar trail along a creek, and within 30 minutes I had three ruffed grouse in my bag. 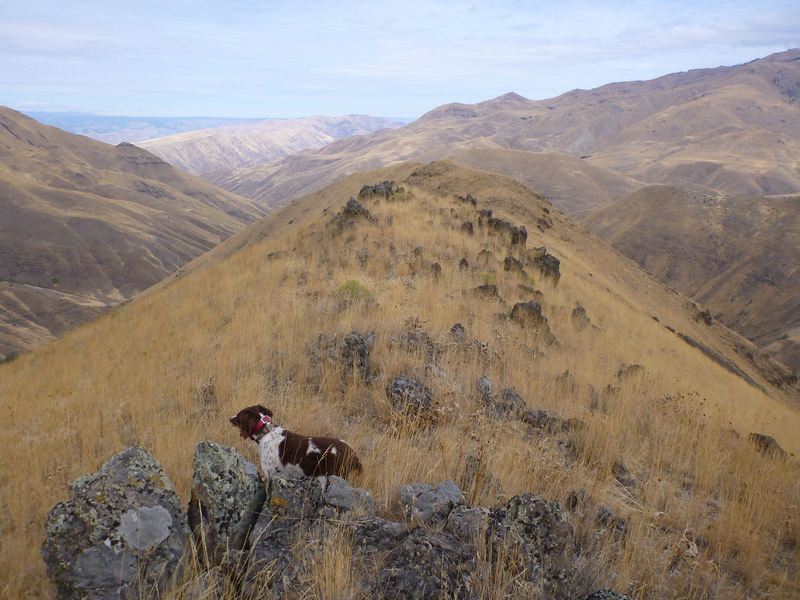 We continued up the road a couple miles and then decided we’d better ascend and look for chukar. Hiking up the steep slopes was bone dry, with thick, very tall bunch grass, often over Angus’ head. Very tough footing. Steady, calm wind, warm. I was dubious about finding birds high up with no greenup whatsoever, but Angus pointed just below the ridge top on the east-facing slope (about mid-day). A good covey of 20 chukar rose, and I got two adults. I kept thinking we’d find some more birds on the way down, but didn’t. Still, a really, really good day. I think I learned they can be anywhere, regardless of obvious food sources. Taking a page out of my old book of hiking to the ridge, working it carefully on both sides with the dog, and praying we’ll find something might be the ticket. It’s just that it’s so damned hard to get up the hill. What a relief to get to the ridge and mostly flat footing. Beautiful. I want to go just once. I certainly hope The Kid had some vegetables to go with those cheetos! Keep taking the boy . He will bring you luck in the future. Congrats on what you did find. Too bad about your prop. Good you helped the stranded ones out. Looks like you have the heart of a true helper. Hope the weather cools down for you soon. Love the failed negotiation picture. The kid has got you.